Thick, loose brushwork, paint expertly applied by a highly experienced hand conveys a nightmarish scene with minimal form. Yet it is all the more sinister for it. The gender of the subjects appearing out of the darkness is only supposed. They could very well be witches (a common type throughout Goya's oeuvre). 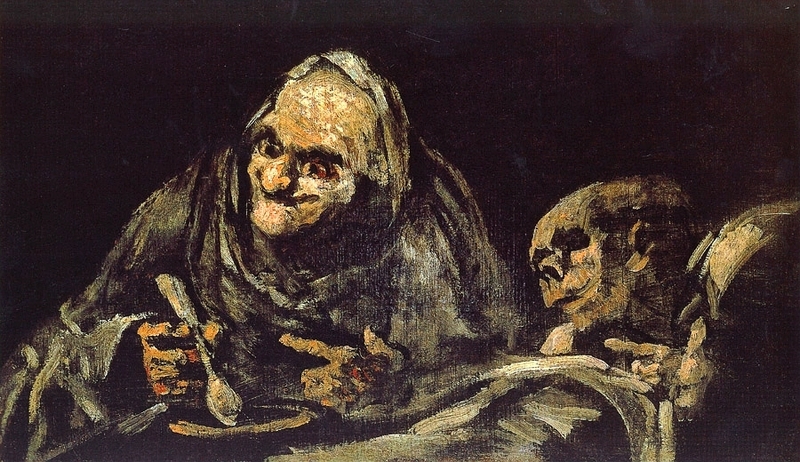 The right figure however, barely there at all with its dark skull-like head, is most likely the apparition of death itself; pointing, along with the other sinister grinning figure, at a spoon, inviting someone - you - to dinner. © Paul Stevens 2010-12. Powered by Blogger.